Excellent for many useful purposes! 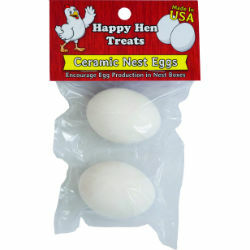 Place ceramic eggs inside nest boxes to encourage egg laying. The use of ceramic eggs is an excellent way to retrain hens that may have developed a habit of laying eggs in less suitable locations. Ceramic eggs can also be used to test for broodiness, to discourage chickens from pecking/eating eggs, for home decor, and much more!